The "People Against Landmines Foundation" is dedicated to the people and the peaceful development of the world and an environment worth living in. Based on humanitarian principles, the organization "People against Landmines" (MgM) is dedicated to providing a safe environment and promoting peaceful development everywhere. MgM concentrates on tackling the growing world-wide threat to civilians as a result of the use of land mines. We seek to reduce the risk of severe injury and death, and especially to alleviate the bottleneck on development that mines cause in post war regions. MgM operates internationally, is politically non-affiliated and is bound (within the limitations of retaining its independence) to engage in integrated cooperation with all like minded organizations and people. It supports all other people and institutions in their efforts to promote peace and development, and works with them whenever appropriate. MgM’s mandate is to be an efficiency oriented operation without seeking gain from profit or acquiring wealth. It has been engaged in actively developing its field-oriented activities since its inception. 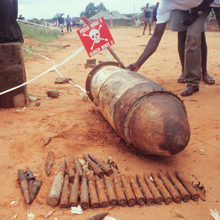 The entire mandate of ‘People against Landmines’ is available for download as a PDF. 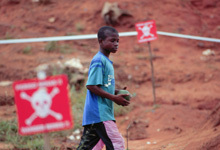 Clearing mines opens areas that have been rendered unusable for years. It is followed instantly by waves of people returning home, often by foot over great distances after years spent in refugee camps. At this time there are rarely any administrative or social structures in place, and the entire weight of health care and service are carried by the MgM emergency medical care team. For example, when the number of patients in Bengo/Angola jumped to hundreds of cases a day, the Johanniter Unfallhilfe stepped in. Without bureaucratic hurdles and with immediate effect, they provided personnel and medication. The actions of the JUH did not establish structures parallel to the national health system, but provided temporary emergency measures. An incidental benefit of this strictly humanitarian assistance was the contact established with the population in need – which established trust and is an important source of information about areas with possible mine contamination. "The Bengo-Resettlement Program is the only one of its kind that has been implemented successful in Angola. This success is 75% due to the excellent effort of MgM". And Minister A. Malungo praised the work of MgM at an international donor meeting on 26.01.99, calling it "top of the line and exemplary". But the real standard for assessing the success of our work is the joy of the people finally returning home after years of misery in refugee camps who can once again determine their own future. Maybe for the first time, many of the children born in refugee camps can see that their daily needs do not only come from the bags of the international support organizations, but can be produced from the rich soil of their own land.